Down ref training and the responsibilities of the second referee. R1, first referee, and top official are used interchangeably on this page. R2, second official, and the down ref are used interchangeably on this page. The R2 can really help make a volleyball match run more smoothly by mastering all of their officiating responsibilities. As an R2, you are there to serve and protect the R1 (first referee). Here are 5 "must dos" for the down ref to really help out the R1. Manage the court during team warm up. The R2 is in charge of the court during team warm ups before the start of the match. Managing the court involves timing the warm up and directing teams on and off the court at the right time intervals. Check each teams line up before the start of a set. The R2 should check each teams line up before the start of the game. Checking the line ups will likely prevent line up confusion and wrong server violations which will help the match to run more smoothly. Blow the whistle for timeouts and substitutions. It is the second referees responsibility to whistle the timeouts and substitutions. The R2 should scan the court and team bench between plays readily anticipating a coach calling a timeout or a player want to sub. Substitution rules state that even if the R1 catches the sub entering the substitution zone before the R2 does, the R1 should give the R2 a chance to whistle the substitution. Give the court back to the R1 after subs and timeouts. Timeouts and substitutions are a time in the game when the R2 is in charge of the court. For example, when the R2 whistles the timeout, the R1 mimics the R2 and the court now belongs to the R2. At the end of the timeout the R2 gives the court back to the R1. 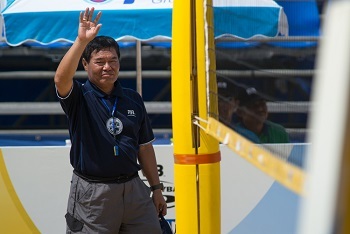 Whistle and signal out of rotation when the scorekeeper is sure there is a wrong server. After the R2 calls a team out of rotation, good preventive officiating would be to make sure the team understands which two players were overlapped and then the R2 lines them up correctly. Mimic the R1s hand signals. Anytime the R1 whistles (except for the service beckon and for serves into the net) the R2 should mimic the R1s signals. Blow the whistle and signal nets, centerline violations, or the ball hitting the antennae. Also, if the R1 doesnt whistle, the R2 should whistle and signal out if the ball crosses the net above or outside the antennae, or the ball hits the antennae, or any object outside the antennae (netting outside the antennae, referee pole, cables, etc). R2 should also watch for the players stepping into adjacent courts or running off into non-playable areas and then making a play on the ball. Watch for overlaps on the receiving team. This isnt really that advanced, its just very unlikely that someone that is new to refereeing will have the knowledge or experience required to spot players out of alignment. It's the R2s job to watch the team receiving the serve and call out rotation faults that occur. Discreetly signal 4 hits, double contacts, back row blocks or back row attacks. The R1 may desire help for judging when to call ball handling or judgment on legal/illegal back row attacks or blocks. How the R2 is going to help out the R1 during play is up to the R1. Every R1 and R2 have their own unique strengths and weaknesses. For this reason, how the R1 and R2 help one another should be discussed before the start of the match. Before each volley, the R1 may like for the R2 to discreetly indicate where on the court each teams setters are. For example, the R2 might signal the R1 the setter is front row. By signaling the R1, the R1 is prepared and alert for a possible legal attack by the setter. Or, if the setter was currently front row and has now rotated to the back row, the R2 can now signal to the R1 that the setter is now back row. So now, the R1 is prepared to call a possible illegal back row attack. It's not a very comfortable feeling having to replay the rally because of an inadvertent whistle. These refereeing tactics may seem subtle, but it's little things like this that help the match run more smoothly keeping the attention on the game and not the officiating. Note: R1 may prefer the down ref to whistle and make the call on obvious back row attacks and obvious back row blocks. Also, if the R1 is screened out of the play, the R1 may like the R2 to whistle when the ball clearly contacts the floor. The R1 is in charge of the match. The R2 should do whatever the R1 says to do. For example, the R1 may not prefer the R2 to signal any ball handling such as double contacts on a hand set. Also, the R1 may or may not want the R2 to call back row blocks or back row attacks. The R1 might want the R2 to blow the whistle and signal right away while a different R1 might prefer the R2 to signal first and let the R1 make the call. Little details like these influence how smooth the match is run. These preferences should be discussed before the start of the match. Your goal as a down ref is to help the R1 keep the match running as smooth as possible. Remember, serve and protect the R1 and keep them out of trouble as much as you can.